This is the tape MacGyver would have used on TV! It's a self fusing extruded tape with no adhesive. It's cohesive- it sticks only to itself, is remarkably STRONG and is the FASTEST FUSING TAPE on the market. This tape makes other silicone tapes appear anemic. If you've used other silicone tapes and liked them, you'll LOVE this tape! This is not cheap tape- this is the best silicone tape. We have 12 foot length rolls, 20 mil thick rectangular self fusing silicone tape in seven colors, even clear. Our 12 foot rolls are 20% longer than the 10 foot rolls sold by others. This tape exceeds MIL SPEC ratings and is made in USA. A two pack of this tape is sold elsewhere on the web for $24.99 plus shipping, and single rolls of this tape cost about $15 each. When you use Buy it now for 21.95 and you will get TWO rolls, a red and black, PLUS a bonus third roll of clear (or any other available color). The clear tape is handy for electrical work as you can see inside the connections without removing the tape. If you would like to substitute colors, please specify at payment. I have most colors in stock but colors may need to be substituted depending on availability. The clear color is limited in availability so get it while I have them. I also have a Colors Kit available. You can buy all seven colors- one of each color- for only $41.95. See my other auctions for the Color Kit deal and the 2 inch wide tape which is 50% thicker! How to compare to other tapes? Rectangular tape is not to be confused with triangular (TGL) tape as the TGL is thinner at the edges thereby giving you less strength for repairs and about 20% less tape for the same width and thickness. The maker of this tape also manufactures TGL tape. TGL is NOT inferior, it is used to make a smooth surface when wrapping over a project. The GL stands for Guide Line which allows you to see where to wrap for a 50% over wrap. Both rectangular and TGL should have a 50% over wrap for maximum strength. You can use this tape for rigging- it's much stronger than any rigging tape and it's the best rigging tape you'll ever use. 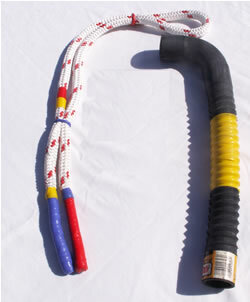 Also great for whipping the ends of lines as well as many other uses such as fixing leaking hoses. This stuff fuses together in about a minute (not bonding- fusing- it becomes one molded piece) and it even works wet- even UNDER WATER. I believe every boat should have some aboard. It comes in handy. You stretch this tape and wrap it around your project. It does not stick to anything except itself and because you stretch it you end up yielding much more than 12 foot of tape when applied as it stretches 300 percent to make a tight seal. Electrical Insulation 8000V per 20 mil layer.